STRAWBERRY REÀL is infused with handpicked Camorosa, Ventana and Albion Strawberries from California. PEACH REÀL is made with only carefully selected varieties of freestone peaches, renowned for their sweet juiciness and fresh peach profile. RASPBERRY REÀL brings you the summer-fresh flavor of sweet and slightly tart Willamette and Glen Clova varieties at peak ripeness for their radiant red color and bursting flavor. Reàl Cocktail Ingredients are chock full of premium fruit from the world's finest growing regions! Just 1/2 - 1 oz. of your favorite fruit infused syrup added to hot tea or iced tea creates unique, refreshing drinks that will be a hit with your friends and family all year round. Mix flavors to make your own fun, unique, gourmet combinations and Bubble or boba tea drinks. Also great in cocktails like Margaritas, Mojitos, Martinis, Daiquiris, and Bellinis/Beer. Mix in sodas and soft drinks, or drizzle on ice cream, milkshakes, waffles, pancakes, oatmeal, and yogurt. Infuse juices, waters, and pasties with Reàl infused fruit syrup. 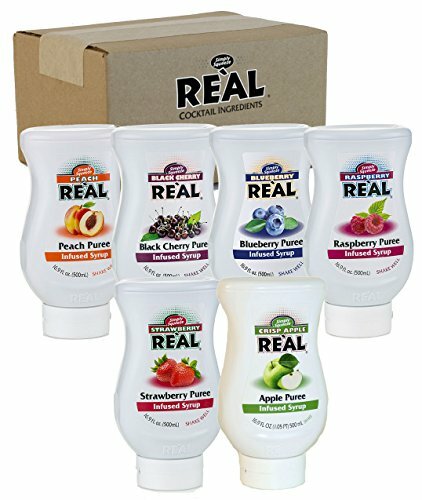 If you have any questions about this product by Real, contact us by completing and submitting the form below. If you are looking for a specif part number, please include it with your message.